Home » 5 Freshest » Haribo Clown Fish. Sad, sad Clowns. 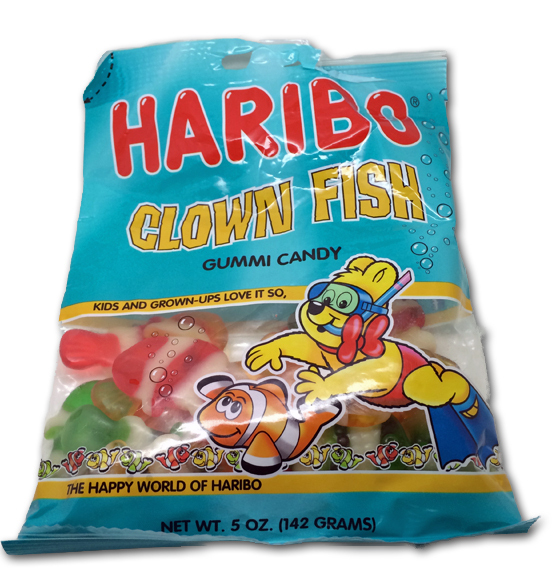 Haribo Clown Fish. Sad, sad Clowns. Anyone else have my back on this? I don’t like these. Sure , at first they look like they’ll rock yer world. Colorful, streaky, aquatic-check! But…there’s just something off about them. Show of hands: who thinks they’re ripping off Albert Brooks from “Finding Nemo” on the bag? There’s no doubt, they’re gorgeous. In fact, they might be one of the most complex, best sculpted gummies ever. The gills, head and tail are all distinct, and they have that odd milky stripe set going through them. Buuuuut… I don’t care. I don’t know about you, but when I’m binge eating gummies, I’m not really stopping to gaze at each one. All that matters (or at least, mostly matters) is the taste, and in that department, these fall right into the middle of the road territory. The red/white fish are flavored blood orange and lemon; the orange/white fish have an orange and lemon flavor; while the green/white fish taste like pear and lemon. Soooo…lemon. What logic is there in making two out of the three flavors orange? Seriously? I will admit, I did like the green best, but…I’ve tried these three times and have been disappointed thrice. Fool me once, shame on you. Fool me twice, …and that’s not good. Fool me three times, thrice even, and…shame….or…general shame/badness in your direction. SEE HOW ANGRY I AM??!? Ironically, these are now one of the “you can find ’em anywhere” varieties of Haribo. But I want to hear from you on this: am I alone in my “meh” ness for these? GO THE THE CORNER STORE, DAMN IT! I’m TOTALLY meh on these, too, dude. 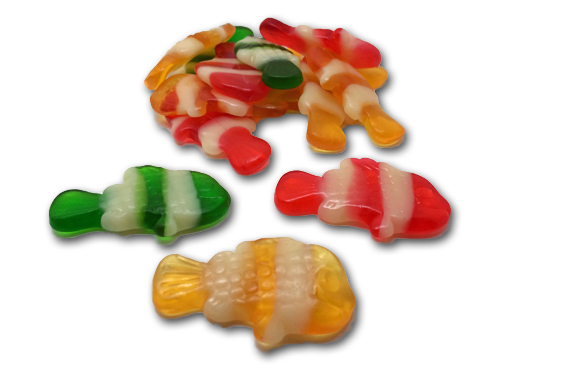 In fact, I’d go so far as to say that I’d rather not eat gummis than eat these…I’d save the calories for another binge another day rather than eat these highly mediocre fishies. I can’t lie these are my FAVORITE candies, I’ve loved them since I was a kid! I’m super sad that they aren’t selling in many stores now.